Recently the global markets have been very volatile and the same is being witnessed in the Indian markets as well. The Sensex has fallen around 12% from peak of 29,045 on 8th Sept, after a 26% rise since the 2016 budget. Here are the key events which have likely affected the mood of the market. The high value currency notes of Rs 500 and Rs 1000 were demonetized on the 9th of Nov, 2016. Just overnight 86% of cash in INR has become obsolete. This measure was taken by the govt. to 1) tackle the widespread presence and hoarding of undisclosed (black) money and 2) destroy the counterfeit notes in the economy. A 50 day window till 30th Dec was given by the govt. to public to deposit or exchange these high value notes. Per estimates about Rs 14.73 lakh crores is in the form of 500/1000 Re notes, and these will be replaced with new Rs 500/2,000 notes which are being distributed by bank branches /ATMs. On 22nd Nov, the RBI eased NPA recognition norms as many SMEs, Agri and other business making cash based settlements/transactions could face repayment issues. RBI has given additional 60 day limit for Banks and NBFCs to recognize loans as NPA over and above standard regulatory limits for dues payable between 1st Nov – 31st Dec 2016 in cases where sanctioned limit is below Rs 1 crore. Daily cash for individuals and businesses: There is a short term pain as people have to wait in queues outside banks and ATMs to deposit, withdraw or exchange money. We expect this to continue in urban areas for 10 days and semi-urban/ rural for another 2 weeks. Already limits are being raised for individuals & businesses. Online /mobile payments are gaining acceptance. New bank accounts will grow; usage of Jan Dhan Yojana accounts has begun. Black/ undisclosed cash: Over many years, cash has become a massive store of wealth in India. The reasons were convenience and lack of bank accounts on one side, and to avoid tax, under-declare property values, run illegal business, naxalite movement, etc. on the other. It is estimated that 25-40% of above 14.73 lakh crore of cash is undisclosed. This money is expected to either 1) be deposited in bank accounts and declared, accruing taxes and converting to white, 2) Some of this may leak out to other asset classes like currency, gold, real estate, forex and other people’s bank accounts 3) Be destroyed so as not to leave a trail. Counterfeit / fake currency: There is a reported presence of fake currency in the system, which is debasing the banking operations. 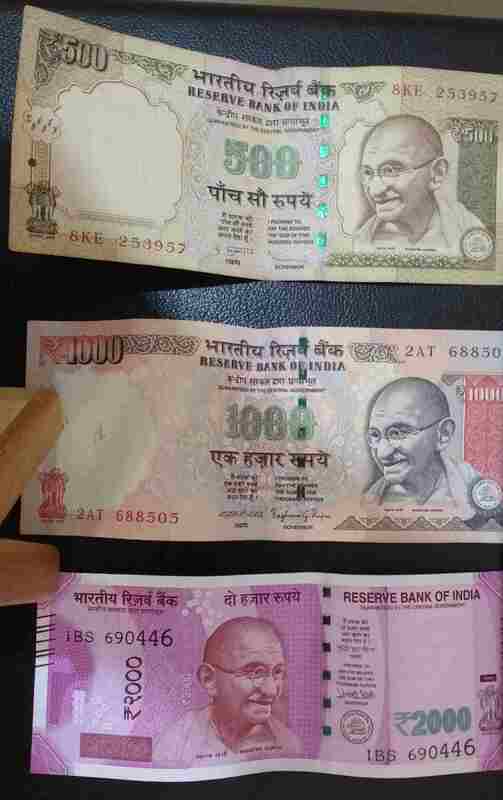 By collecting all high value notes and issuing new ones, these will be flushed out of the system. It’s difficult to estimate this type of cash. Impact: For individuals and in business, there will be some disruption before we limp back to normalcy. This will be worse in rural areas with poor banking penetration. But 30 years of cumulative black money will in one stroke be converted or destroyed. This cash exchange, coupled with GST, may radically alter consumer behavior. Bank accounts usage will multiply, as also money transfer facilities and transparency. The govt. is trying to switch from equilibrium in Tax Non-compliance to one in Compliance. In other words break a vicious circle of saving in black money to a virtuous circle of white money. The market sentiment in the short term is affected as several cash oriented sectors may be impacted. Real estate, jewellery, microfinance / NBFC and retail operations may be affected. However the new 22nd Nov rule will ease liquidity for NBFCs and allow operations to stabilize. Data available today indicates the money deposited with banks by customers crossed Rs 6 L crore from Nov 10, after demonetization. Withdrawals, including exchange of old notes, were above of Rs 1.35 L crore (per IBA). We estimate that in another 10 days, the depositing should be complete. The withdrawal / exchange of notes may take 2-3 weeks more to meet daily cash needs. Donald Trump won the 45th US Presidential elections on the 9th Nov, 2016. This was against the market consensus of various polls indicating a win for Hillary Clinton, thus shocking many Americans and investors worldwide. After the initial surprise, the US markets stabilized. Impact: We expect the US policies to change once Trump takes over presidency in Jan 2017. The immigration, foreign business treaties, tax rates and a host of domestic policies may change. The impact on Indian investors too will unravel over 6 months. There is a higher uncertainty in US markets. Some FIIs are pulling out funds from Emerging Markets in a Risk off move. However after an initial knee-jerk reaction, this may not continue. Indian stock markets fell almost 2% on 29th Sept, 2016 after the Indian army conducted “surgical strikes” on terror launch pads across the Line of Control (LoC) in Jammu and Kashmir amidst rising tensions between India and Pakistan. Thus the Indian side has taken a firm stand against terror from Pakistan. This event has been followed up with many incidents of firing on both sides and disruptions along the border. Impact: We feel that there will be ongoing tensions between India and Pakistan. However a war like situation might not come up. Though the issues are unlikely to be solved soon, negotiations and dialogues should happen. Any aggressive attacks from either side could lead to a short term fall in markets. There is a higher uncertainty. The Chairman of the Tata Group, Cyrus Mistry was ousted from his post. The past Chairman Ratan Tata took over and will appoint a new Chairman within 2-3 months. The main reason for this was stated to be a loss of confidence in Mistry. This sounded like a painless coup for investors but the spat between the two has gone public, and it may be some time before the changes are rolled out across the group. Impact: We feel that the operations of most companies will not be affected in the near term. Some strategic direction may be changed. The aggressive and combative stand of Tata group seen in recent cases like Tata Corus and Tata Docomo may soften in line with group philosophy. We can see that there has been a fair correlation between Indian and USA markets over 1 year. But over the last week, perhaps thanks to demonetization and the Trump election, Sensex has fallen relative to other markets. There has been a sharp fall in Indian indices and many stocks from recent peaks. The fall reflects a break in the positive run, an increase in uncertainty and sudden unexpected events. It’s not all bad news. We feel that most of the events are short term disruptions, with a recovery possible in a period of 2 weeks to 3 months. This is a correction in an overall bull run as we are seeing a lowering of interest rates, positive moves on GST and 7th pay commission and until recently, steady investments from FIIs and domestic retail. The IPO market too has been euphoric with a lot of pent up demand from retail investors. This short term fall is a buying opportunity if you have a time horizon of a period longer than 3 months.